I am working on a simple openwork tank top for my Mom in Mango Moon Elements Recycled Silk. I love the vibrancy of this yarn! And it is ethical. Beauty and ethics make a stunning combination. This yarn is handspun in Nepal by the Nepali Women’s Empowerment Group providing shelter, education and health care for women and their families. When we first met, the yarn reminded me of the recycled sari silk yarn, which can often feel unpleasant. Working on the top has acquainted me with this yarn and there are a few things I want to pass along. 2) Those little silk strands want to reach out and grab each other. Two strands hanging next to each other mate before you can say boo leaving you to try to figure out where one strand ends and another begins. Too bad they don’t produce little silk yarn babies, then it would all be worth it. 3) The yarn is softer than I expected. I anticipated sore hands and that hasn’t happened at all, the little bits of straw spun into the yarn can be scratchy, though. 4) Each colorway has a predominant color, in my case Autumn Forest has strong green and gold coloring. 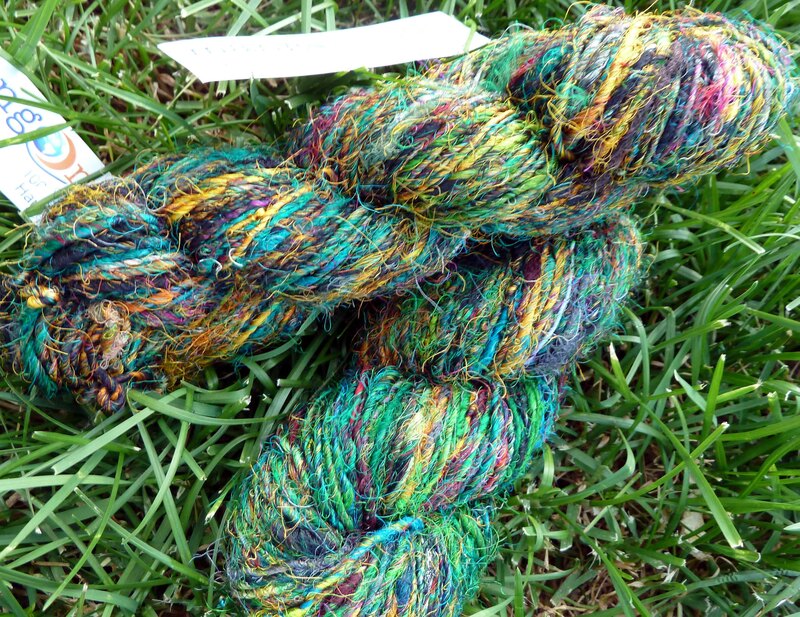 However, one skein will have more green and the next more gold even though they’re from the same dye lot. Fortuitously, the yarn incorporates so many colors that I can’t really tell the color change in the top so far, let’s hope it stays that way. I recommend getting some of this yarn if you love vibrant beauty and ethics. You get 150 yards per skein. I am knitting with a US 11 needle. I loved it! So funny! Maybe you should be a comedy writer as well as a knitter. Can’t with to see the finished product. PS I pulled the straw out when I worked with it. Come on, who wouldn’t want some straw with their yarn?